This article provides information that can guide you about how to budget for marketing and where to invest your marketing dollars. 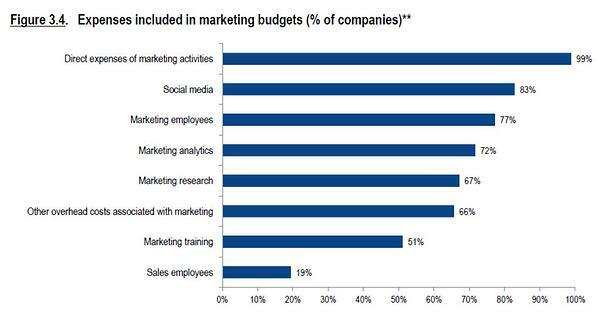 How much are companies spending on marketing? Where are marketing dollars invested offline and online? What marketing strategies and tactics are getting results? Which Marketing Strategies & Tactics Are Getting The Best Results? What Percentage of Marketing Budget Spent On Digital? How Much Should Your Firm Budget For Marketing? 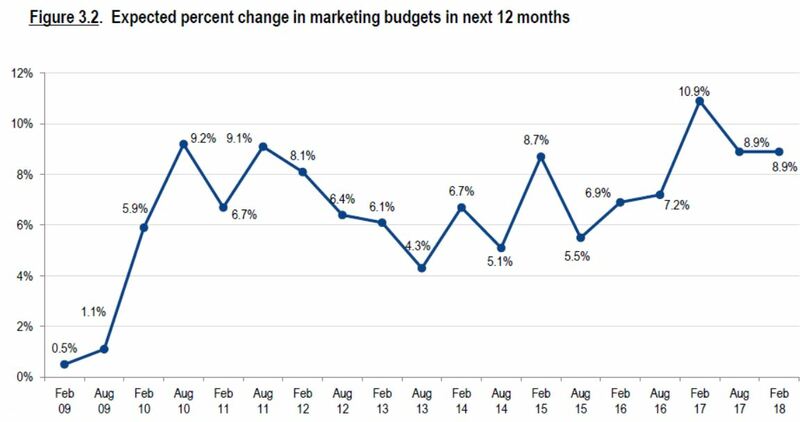 First, a look at how marketing budgets are changing. For nine consecutive years, top marketers were asked how their marketing spend was expected to change in the upcoming year. 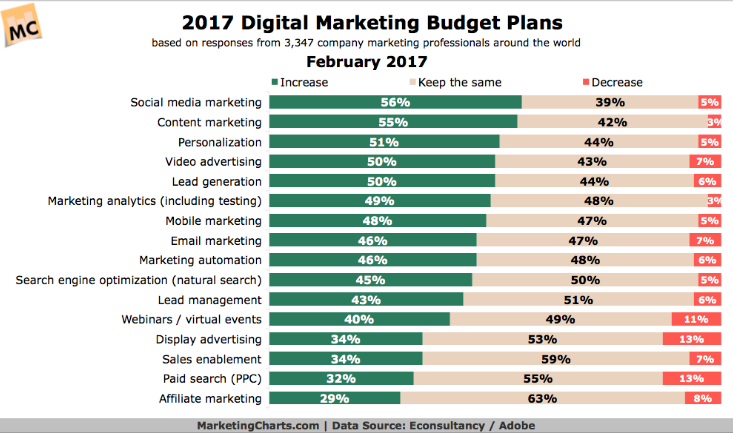 Since 2009, marketing budgets remained relatively consistent or increased compared to the previous year for the majority of participants. While 2017 saw an ambitious expectation for increased spending of 10.9% in the next 12 months, the actual increase came in at 7.1%. With no evidence to suggest differently, 2019 marketing budgets are expected to remain consistent with 2018 levels or increase. 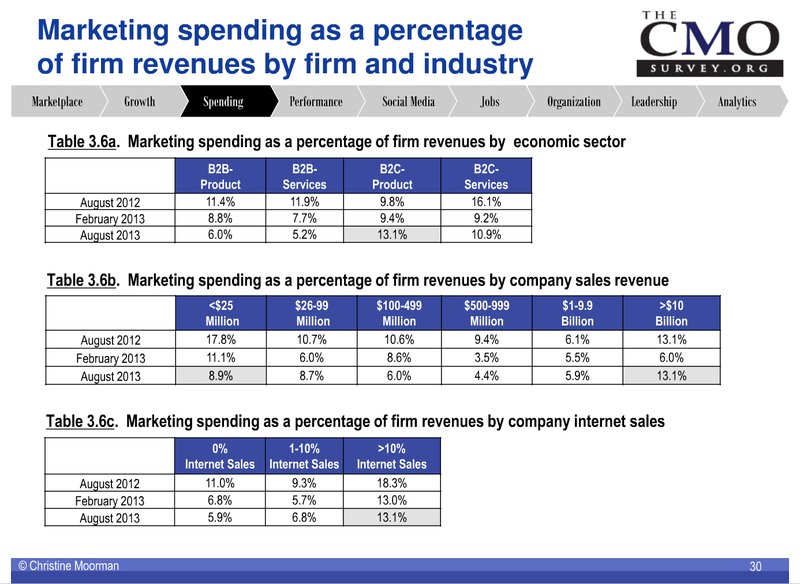 The report above from cmosurvey.org shows the variation in the expected rate of increase in marketing spend, not the actual increase. The largest increase in projected marketing spend occurred shortly after the recession of the late 2000’s, but continues to fluctuate between 4 and 10%. 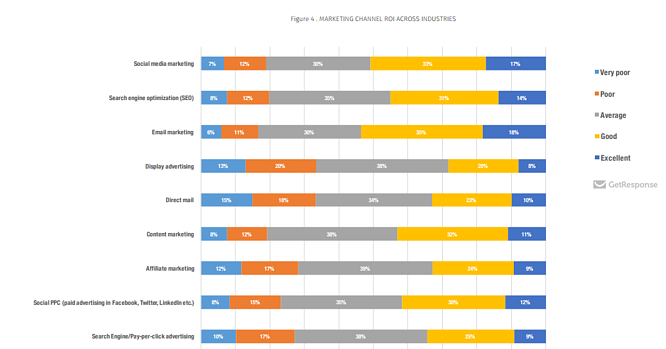 Marketing spending as a percentage of revenue tends to fluctuate, but generally hovers between 6.5% to 8.5%, with the highest percentage again coming from B2C service companies followed by B2C products. 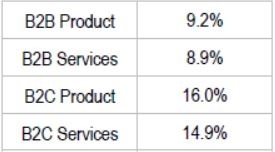 Again, B2C services increased marketing budgets as a percent of revenue quite a bit in 2018 over the previous year, rising from 7.3% to 11.8%. 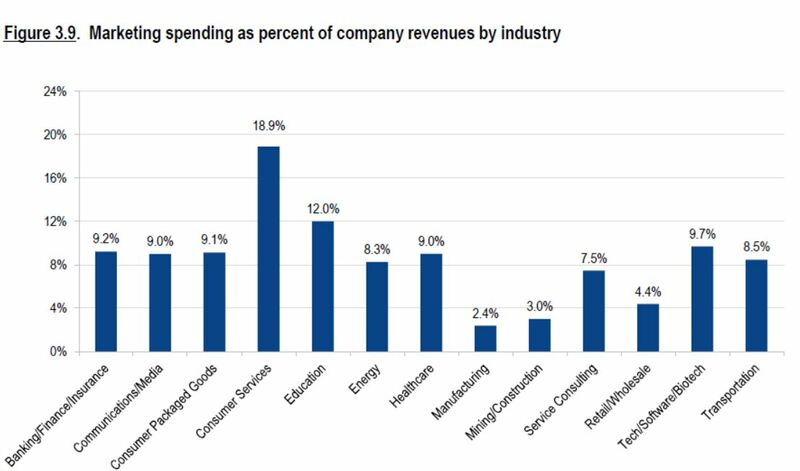 The chart below shows the wide variation by industry in marketing budget as a percent of total revenue. The next question to answer is how to allocate marketing budgets across channels – offline and online - and how to spread the online investment across the various online/digital channels. Reports from Forrester Research and eMarketer show the estimated allocation of marketing funds offline vs. online and across the digital channels. Mobile garnered about 10% of the total digital marketing budget and slightly less than 3% of the total marketing budget. The chart below showed strong increases in digital channel investment in 2017. At least half of all respondents planned to increase spending on social media marketing, content marketing, personalization, video advertising, and online lead generation. Traditional channels did not fare nearly as well. Print, radio, and television were expected to see a net decrease in total marketing investments. Once again, these are averages. How marketing funds are ultimately allocated is driven by the nature of the business, the competitive marketplace, and how target customers behave through the buying funnel. In a recent survey of 2,500 digital marketers, respondents reported on what marketing activities generated the best ROI. Email marketing still leads the way with the highest percentage of Excellent and Good ROI results reported, with social media marketing following closely behind. Marketing technologies and automation are proving effective at bringing together the most effective marketing tactics (email marketing, organic search, social media marketing and content marketing) to achieve better results. Which Social Media Channels Should I Invest In? 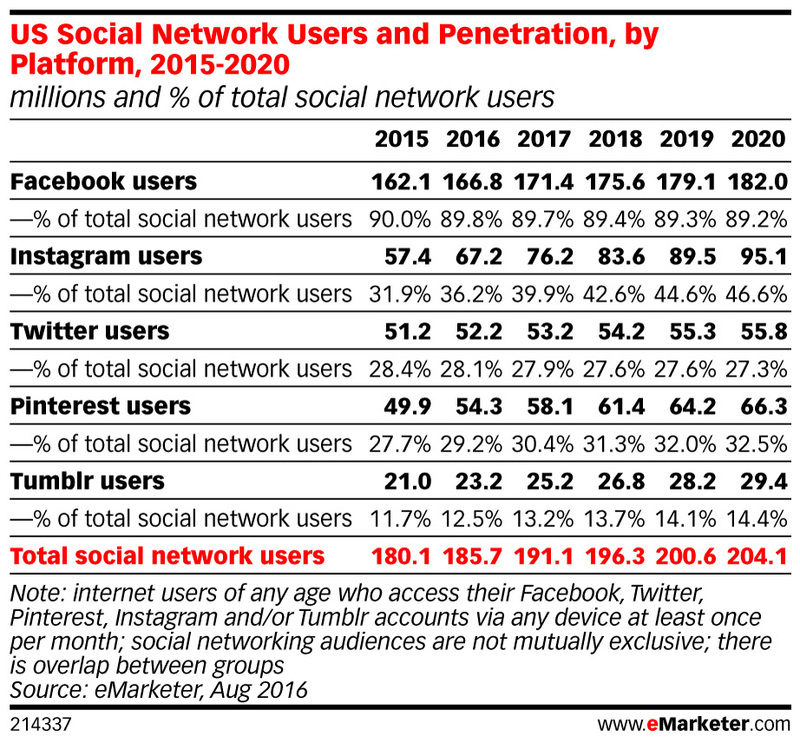 An August 2016 report from eMarketer shown below projected social media penetration by social platform through 2020. While there are no direct investment assessments associated with this particular study, it does show noteworthy trends among the major social channels. Facebook was expected to remain king, with 90% of social media users utilizing the platform. Instagram was expected to grow, from 32% penetration to 47% by 2020. Other social channels with baked in advertising features, such as Pinterest and Twitter, will continue to have relatively low penetration, peeking around 33% of users by 2020. This data suggests an emphasis should be made on Facebook and Instagram channels for social advertising. 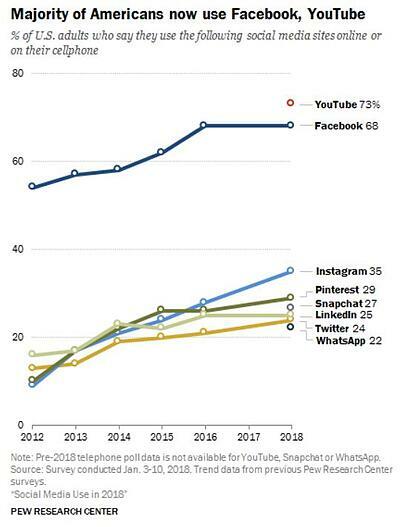 A more recent study from early 2018, still shows Facebook leading the way, with 68% of adults using the platform. While growth there has leveled off, it remains an important channel for many marketers. YouTube, while not a traditional social channel, is used by 73% of US adults, and a whopping 94% of 18-to-24 year olds. In a 2018 report from Hanapin Marketing, 62% of respondents said they planned to increase their PPC budget in the next 12 months. Google again leads the way, with 78% of those surveyed planning to increase their Google Ads budget. Facebook, which has become a respectable competitor to paid search, expects to see increased investments by 66% of respondents despite weathering some controversy and changes to their ad platform this year. Instagram and Twitter, by comparison, expect to see increased investments from less than half of respondents (28% and 18% respectfully). 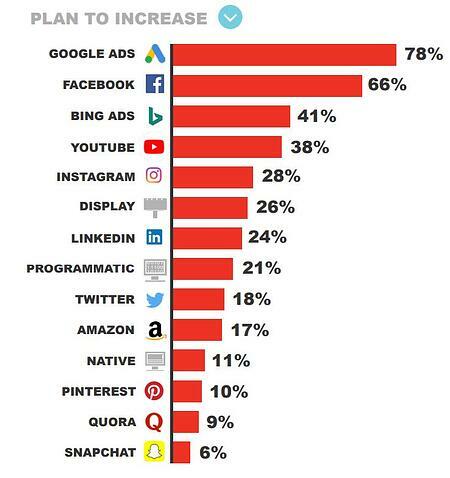 Snapchat, which has a greener ad platform, was at the bottom of the list, with only 6% of respondents expecting to increase investments into 2019. This report bodes well for "digital traditionalists," who continue advocating the importance of search over social channels. This chart, also from cmosurvey.org, shows the sharp contrast between digital growth and offline decline. For a half decade, investments in traditional advertising have consistently dropped by single digit percentages each year. 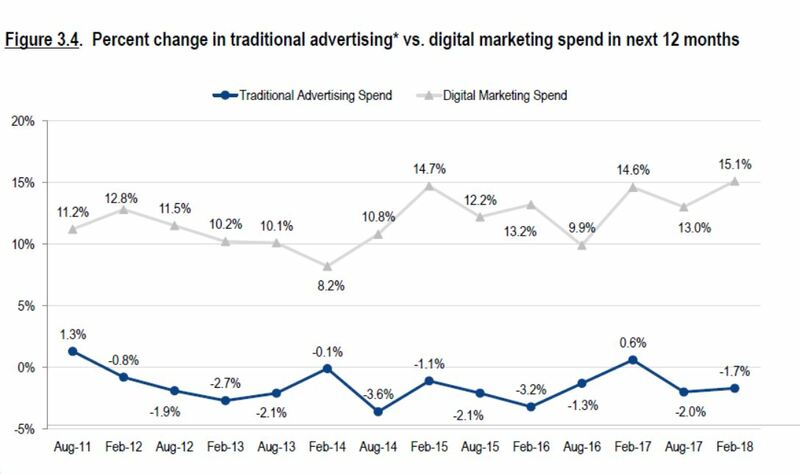 Digital marketing spend, by comparison, has consistently grown by double digit increments year after year. This means businesses are shifting their marketing spend. What used to be spent on radio, television, and newspaper is now being spent on search, email, and social. This trend is expected to continue for the next several years. This marked the first time in history digital spend surpassed TV ad spend in the US. And the gap has only widened—by 2020, digital spend will surpass television by 36%. Digital spend is only a portion of total marketing spend for most businesses. Businesses who rely more heavily on the internet to generate sales (e.g. an ecommerce business), invest a greater percentage of their marketing budget towards digital. While the latest Forrester Research report projects that digital marketing spending will make up 44% of all ad spend, this number can vary depending on a variety of factors including industry, growth plans and local market. For more traditional businesses, which rely on offline AND online activity to fill the sales funnel, a healthy mix of marketing investment is to be expected. 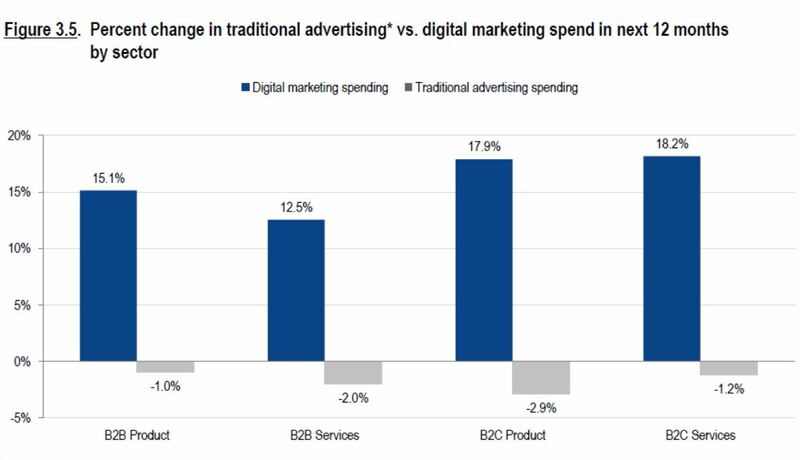 Across all sectors, digital marketing budgets have increased consistently, while traditional channels have lost ground. The CMO survey offers some answers. In the charts below you’ll see how marketing professionals from all types of firms responded to this question in 2018. 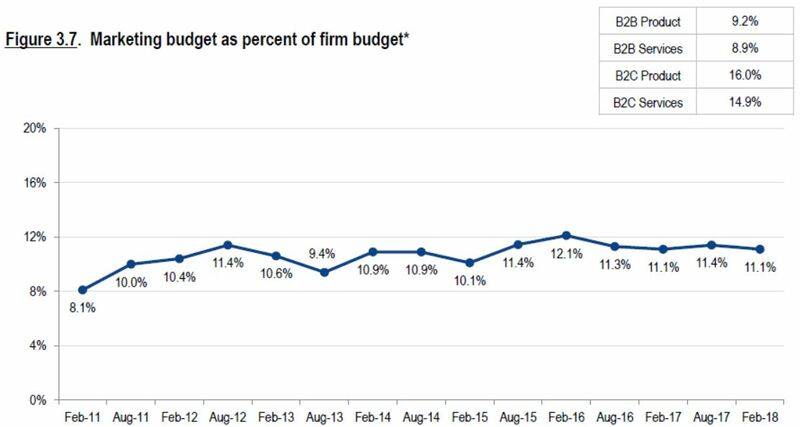 Marketing budgets as a % of overall firm budgets have been fairly consistent for B2B firms the past few years, in the 9-11% range, but are expected to increase in the next 12 months for B2C companies, up to as much as 16%. As a point of comparison, here is data from 2012-2013. 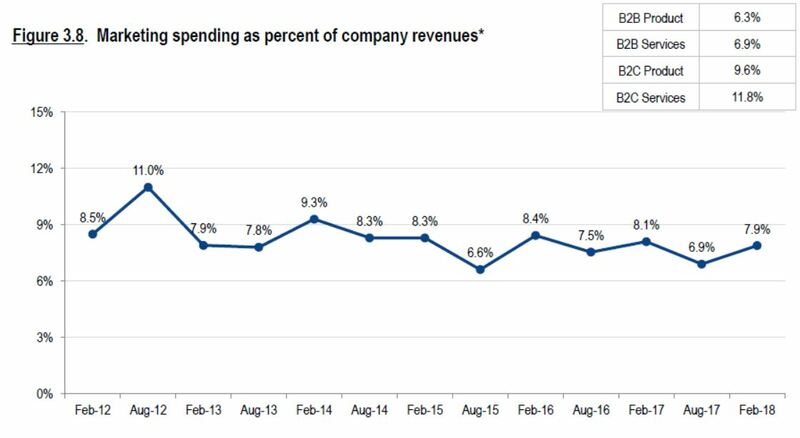 Based on these results, we see that B2B marketing spending has increased over the past couple years, whereas B2C marketing spending has dropped slightly. It is important to note that these percentages represent the total marketing investment, not just advertising or media spend. They include things like marketing staffs, customer relationship management, investments paid to agencies and other outside suppliers, advertising costs, media spend, etc. Firms seeking to grow market share will likely be on the high side of these averages vs. firms planning for modest growth, which may be on the lower side. Additionally, the competitive nature of a certain marketplace will influence where a particular firm falls among these average figures. Marketing & Digital Budget Summary - What Does It All Mean? We purposely compile surveys from a variety of sources over a number of years to give you an objective perspective, and appropriate context. The conclusions of each survey are not always consistent. This inconsistency represents the diversity of business needs and the marketing strategy that accompanies it. More mature marketers tend to slow their marketing spend as better results measurement enables them to spend smarter. 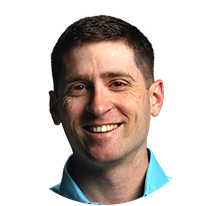 Bringing together the data from these credible sources in the marketing community should help you determine how much to spend on marketing, and where to apply those investments. At WebStrategies, Inc, we know your marketing investments should result in profitable sales. Learn more about how online/digital marketing methods such as inbound marketing, Google Analytics, display advertising, and web design and development can help you achieve your sales goals. Where do you get the most bang for your buck when it comes to your marketing budget? Let us know in the comments section below. What Is A Good Cost Per Click?